How many times has it happened that you wished for a fogless bathroom mirror in your shower area to multitask and complete shaving, washing, and scrubbing while showering? Shower mirrors are a must-have when you are rushing in the morning but the only problem is that you have to wipe the mirror every ten seconds as it gets covered with fog and becomes hazy. Solution? A fogless shower mirror. We have compiled a list of nine best fogless shower mirrors along with fogless shower mirror reviews to help you find a good mirror for your shower area. Our top pick for the best fogless mirror for shower is the ToiletTree Products Fogless Shower Mirror with Squeegee. It is a top rated fogless shower mirror and is very popular for its simple and elegant design which works for smaller as well as bigger bathroom spaces. It is made up of shatterproof glass and comes with a reservoir so it never fogs even if the temperature of the shower water is very high. The size of the mirror is also sufficient enough for shaving and cleansing needs. 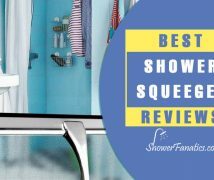 The additional razor hook and squeegee make this shower mirror worth the price and the ease of maintenance adds to its advantages. 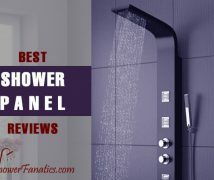 Our bathroom experts have done ample research for compiling these detailed reviews and this buying guide will help you find the best fogless shower mirror for your bathroom. You can also refer to this comparison table which will make it easier for you to look at all the features of all the models so that you can get a model worth your money. With silver, black, and gray color options to choose from, the Toilettree fogless shower mirror is available in three size options which include a standard size in silver, a travel size in gray, and a large sized mirror in black color. 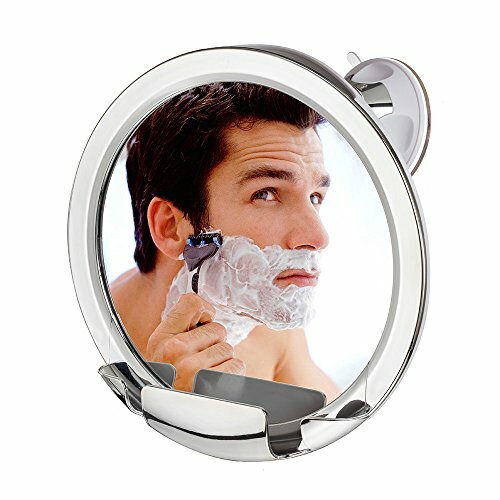 It is one of the most popular fogless shaving mirrors available in the market. The mirror comes with a cleaning squeegee and is known for its shatterproof patented mirror glass which does not fog under any conditions. The mirror is to be fitted on the wall with an adjustable bracket and tilts in upward and downward directions. It is fitted with an acrylic reservoir that needs to be filled with warm water before use. Some other unique features of this mirror are that it is illuminated for better vision and can be attached to any shower wall using double-sided tape and removable adhesive. The price of the mirror is a bit higher than other models. The mirror does not fog at all because of its patented glass technology. It comes with a shower squeegee which makes it easier to clean it after use. The acrylic reservoir is located at an easy angle and is convenient to fill before use. The large size has a thinner design which looks classy and also comes with hooks to hang shower essentials. The removable adhesive that comes with the mirror is not very durable. The mirror is expensive as compared to other fogless shower mirrors. It is a good shower mirror for people who do not want to damage their shower tiles with hooks or brackets. The finish and fogless design with a standard size make it a good mirror for all your shaving and washing needs. 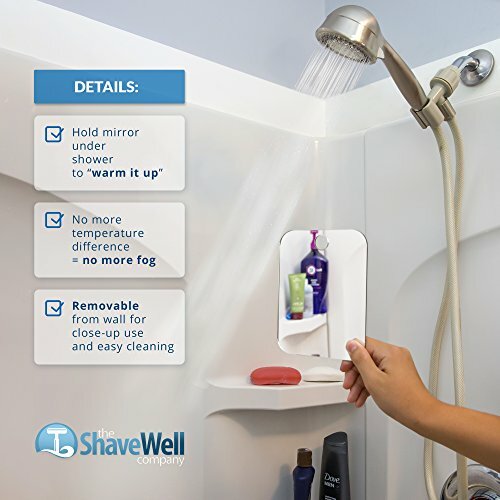 If you are looking for affordable fogless shower mirrors for shaving, this fog-free shower mirror from The Shave Well Company is a good option to consider. It comes with a special coating so you need not fill a reservoir with hot water before use. The mirror is available in three sizes but is comparatively smaller than other fogless mirrors since it is designed for shaving purposes. It has a sleek design which works well for smaller spaces. A hook is included with the mirror for hanging it on the shower wall with an adhesive. The price of the mirror is affordable if you choose the single deluxe mirror option. 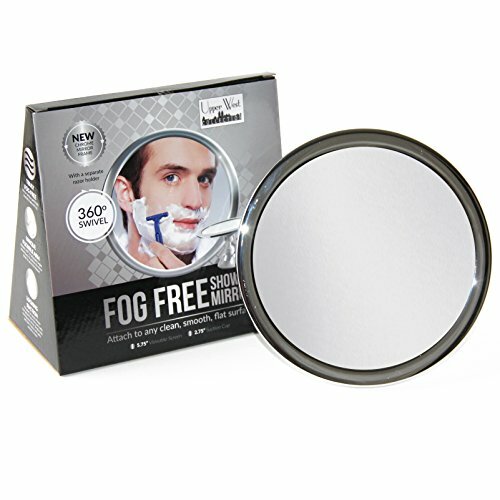 It is specially designed for shaving needs and uses a coating to keep the mirror fog-free. The sleek design and the compact size are good for smaller bathrooms. 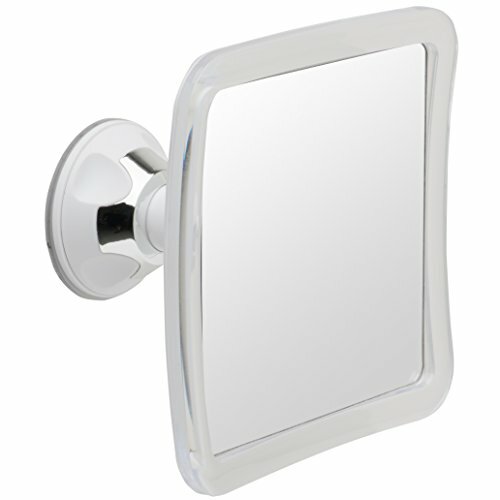 The mirror comes with a hook and can be attached to any type of surface with adhesive. The price of this mirror is budget-friendly as compared to its quality. The mirror does not come with LED lighting or squeegee. It relies on coating for a fogless finish which can get degraded over time. It is a compact fogless shower mirror which serves its purpose of a shaving mirror well. The affordable price and frustration-free installation are some of the other advantages of this fogless mirror. Available in five stylish colors, this shower mirror from Mirror On A Rope comes with 5.5′ of sturdy paracord that can be used to hang the mirror from the shower head. Two removable hooks are also included which provide additional support. The mirror has a reflective surface on one side and can be held at any angle to get better results. It uses heat plate for removing fog and you have to heat the back of the mirror with hot water before use. The size is moderate and is sufficient for basic showering and shaving needs. It removes fog as well as shadows if held properly. The price of the mirror lies in the middle range. The reflective cladding helps to redirect the light falling on the mirror. The option to hang the mirror by the rope or hooks makes it very handy while traveling or changing its location. The five color options are quite stylish and add a designer touch to your bathroom. The removable hooks attach well to any surface and provide additional durability. The reflective coating on the mirror begins to wear off after a while. The paracord hanging option is not very feasible as the mirror keeps moving. This mirror is unique in terms of design and gives a very clear image if you install it correctly. The rope is quite sturdy and makes it easier to hold the mirror while shaving for closer angle. The reflective coating helps control shadows too. A simple yet functional mirror just like its name, the Simplehuman wall mount shower mirror comes with an anti-fog coating and can be installed on the wall with the help of adhesive glue and silicone strips provided with the mirror. The mirror comes with a pivoting bracket which allows you to rotate it in all directions. A razor hook is also provided at the base of the mirror for additional storage. It comes with a protective film which needs to be removed before usage. The size of the mirror is moderate as it is designed for shaving purposes. The price is high as compared to the minimal features. The coating done on the mirror does not fade easily and is easy to clean. The mirror does not require any extra efforts for keeping it fog-free while showering. The multi-pivot design allows the user to tilt the mirror in any direction. The additional razor hook provides space to hang the razor after shaving. The size of the mirror is a bit small as compared to some other fogless mirrors. The price of this model is high. 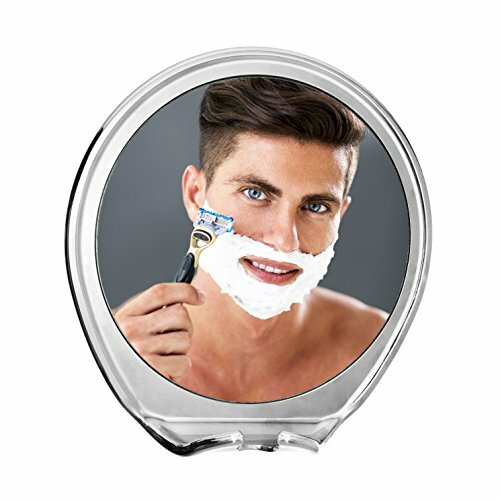 It is a small and handy fogless mirror for all your shaving needs. With its minimal and lightweight design, this mirror is good for travel purposes too. The multi-pivot design and the additional razor hook make it worth the high price. One of the few models which come with a strong locking suction cup for attaching the mirror to the wall, the mirrorvana fogless shower mirror comes with a fog-free chemical coating and does not need any hooks. It is quite lightweight and compact and can be installed in just a few seconds on any surface. The shatterproof mirror design makes it durable and sturdy. The pivot neck of the mirror allows the user to adjust the viewing angle easily. The translucent frame makes the mirror look elegant and stylish. The price of the mirror is reasonable as compared to other fogless shower mirrors available in the market. The curved surface and pivot neck make the mirror adjustable and user-friendly. The locking suction cup holds it in place for a long time if used on a flat surface. It has a sturdy and stylish design and is fitted with a shatterproof mirror. The he price of the mirror seems affordable when compared to its features. The chemical coating on the mirror degrades with use and needs periodical respraying. It does not come with illumination or a razor hook. The installation mechanism of this mirror makes it unique and suitable for all surfaces. The size and shape of the mirror make it very convenient for the user and the affordable price is an added advantage. Most of the fogless mirrors available in the market are rectangular in shape but this mirror is round and is available in clear and chrome color options. The JiBen fogless shower mirror comes with a suction cup for installing it on the wall. The mirror has a swivel arm which allows 360 degrees rotation. A razor hook is also included in the design for ease of use. A special anti-fog chemical coating helps the mirror surface remain fog-free but you have to wipe it with warm water once before showering. The diameter of the mirror is 5.75 inches. The suction hook sticks to clean and smooth surfaces only and not on textured surfaces. The price of the mirror is on the higher side. 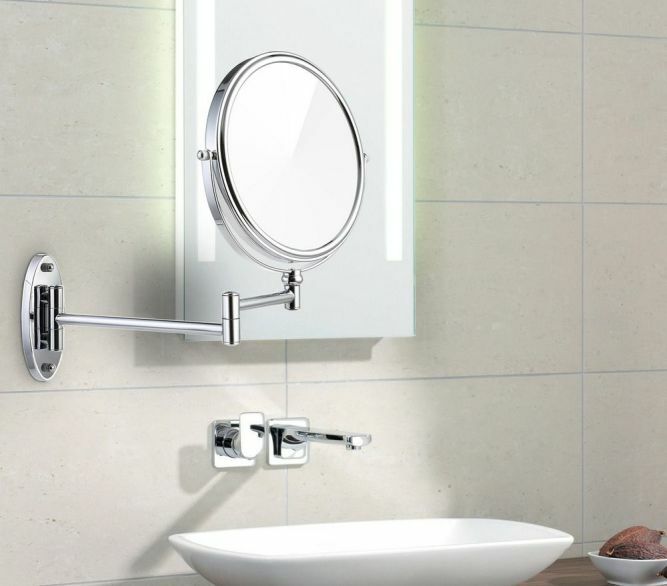 The circular shape with a swivel arm enables the user to hold the mirror at any angle. The strong suction mechanism holds the mirror in place tightly. The anti-fog chemical coating lasts for years if maintained properly. The razor hook provides additional space for keeping your favorite accessories. The mirror needs to be wiped with hot water once during use. The suction cup does not stick on any surface if it is not smooth enough. The compact yet sturdy design of this mirror along with easy installation makes it very popular among its counterparts. The extra razor hook and the durable chemical coating for fog-free experience are some of its other advantages. Another circular fogless shower mirror, this no fog mirror from Upper West Collection is a boon for families who share the same bathroom. It comes with a suction lock and a 360-degree swivel arm which also tilts upwards and downwards for height adjustment. It does not come with any water reservoir and you have to splash it with hot soapy water once while using the shower to get a fog-free mirror. A bonus razor holder is also included with the mirror. The diameter of the mirror is 6.5″ so it gives a good view of the whole face. It is available in two variants with 1x and 2x zooming power respectively so it is a good option for people looking for a magnifying fogless shower mirror. The price of this mirror is high as compared to its features. The adjustable swivel arm adjusts to all angles and tilts in all directions. The mirror is quite easy to install and only needs one hot water splash for remaining fog-free. 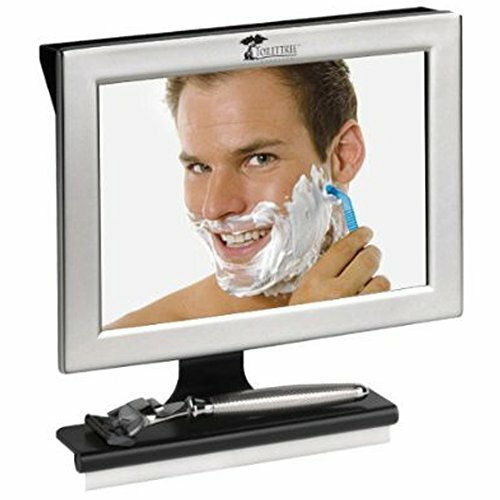 The size of the mirror is good and the bonus razor holder provides extra storage space. The coating is of a good quality and does not degrade quickly if cleaned regularly. The price of the mirror is higher than its counterparts with similar features. The suction cup does not adhere well to rough surfaces. The mirror is very adjustable because of the swivel arm and can be used by all members of the family with a slight height adjustment. It does not require a lot of efforts in terms of installation and is quite durable as well. One of the most stylish and minimalistic fogless mirrors available in the market, the Cheftick shower mirror is known for its classy design. It comes with a powerful locking suction cup and is easy to reposition also. Instead of a razor hook, the mirror is fitted with a razor holder which can also be used to keep other small items. It is a reservoir-type mirror which needs to be filled with hot water before use. It rotates smoothly and is made up of plastic so it is lightweight as well. The price of the mirror is very high and it is one of the most expensive fogless shower mirrors available in the market. The design of the mirror is quite stylish and is suited for smaller bathrooms. The reservoir at the back is located well for easy refilling and emptying. The razor holder has ample space to keep other smaller items. The mirror comes with a swivel arm which allows it to rotate smoothly. This mirror is very expensive as compared to other fogless shower mirrors. It claims to be a shatterproof mirror but is not shatterproof according to some users. It is a very stylish mirror that will go well with a minimalistic shower area décor. The elegant design and the ease of use make it a good fogless mirror to consider if you can stretch your budget a little. 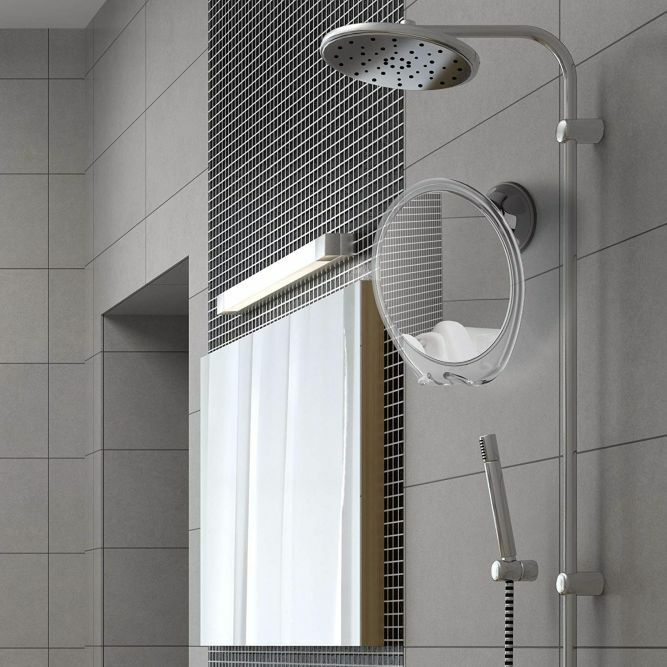 One of the very few mirrors of the attached type, the InterDesign shower mirror is attached to the shower arm and is available in four color options. 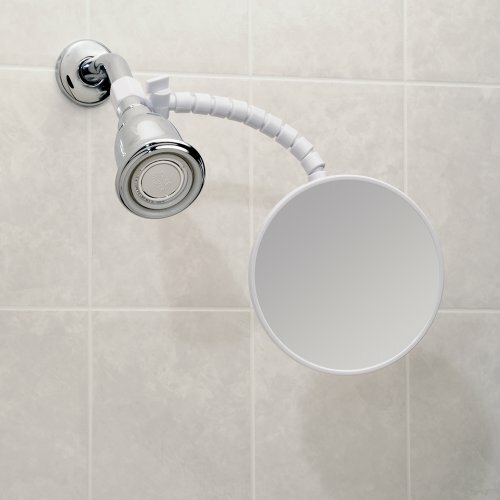 It comes with a flexible arm that can be used to attach the mirror to the shower arm without any suction or glue. The mirror is made up of acrylic while the rest of the product is made up of durable plastic. The principle behind this design is that when you turn on the hot shower, the water flows into the back of the mirror before coming out of the shower and removes the fog by heating up the mirror. The price of the product is quite affordable. The design of this mirror is very unique and does not require any additional space on the wall. It does not require any extra efforts to fill the reservoir with hot water. The flexible arm makes it easy to swivel the mirror in any direction. The price of the mirror is very affordable as compared to its features. The plastic arm can leak if not fitted tightly into the shower arm. Dark spots begin to develop on the reflective coating after a few months of usage if not cleaned regularly. It is a very unique mirror for the shower that does not require any extra efforts from the user since hot water flows directly into the mirror reservoir. It also remains completely fog-free and swivels in all directions easily. What is a Fogless Shower Mirror? A fogless shower mirror is a mirror which does not fog like regular mirrors while you use the shower. They are made using a special chemical coating or are installed with a heat plate which keeps the mirror from getting foggy. These mirrors are quite handy when it comes to multitasking in the shower and are designed for shaving or cleaning purposes. Most of these fogless shower mirrors come with a coating and a few come with a hot water reservoir. A few models with coating also need to be wiped with hot water once while in use to get a completely fog-free finish while in the shower. 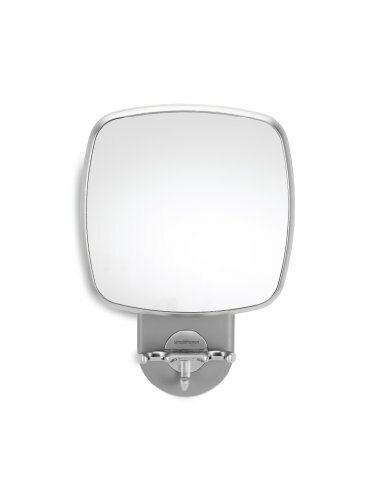 A heated shaving mirror comes with a heating plate or a water reservoir that needs to be filled with hot water before use to keep the mirror surface free from fog. The reservoir is usually situated behind the mirror surface and heats it evenly to help the steam remove the fog. Mirrors with a heating plate need to be wiped with hot soapy water while in use to get the desired results. These mirrors are a little preferred as compared to coated mirrors as they require some efforts every time you want to use the shower and the mirror together. This type is more common since it is very easy to use and does not require any additional efforts. These mirrors are coated with a special chemical coating that keeps the fog under control. One common problem people face with these mirrors is that the coating begins to fade or diminish with use and can render the mirror useless after a few years. Some people tend to remove the mirror when not in use which extends the coating life by a few years but is not very practical. There are anti-fog sprays available in the market which need to be sprayed on these mirrors periodically to maintain the coating. This is a very unique type of fogless shower mirror which is attached to the shower arm. It is definitely more complex to install as compared to the heated mirrors and coated mirrors. The mirror comes with a valve which can be used to siphon off the water and fill the hot water reservoir situated behind the mirror. They are also designed for a higher height so is not very suitable for short people or for close viewing angles. The size of the mirror should be considered according to the type of tasks you need it for. Shaving mirrors are generally smaller while normal bathroom mirrors tend to be bigger. Round mirrors with a diameter of around 6.5 inches are good enough for daily use. You can go for a large fogless shower mirror also but avoid them if you are looking for a travel fogless shower mirror. Heavy fogless mirrors can fall off the wall even if fitted with the strongest suction cups and can cause injuries. It is better to invest in a lightweight fogless mirror since most of the models are attached on the wall with suction cups or adhesives which are not strong enough to bear the weight of heavy mirrors. Mirrors are not something people buy every day and are supposed to last for years. Check the durability of a particular model by reading its customer reviews and discussing with fellow users about how long their model lasted. Some models of fogless mirrors are easier to install than others. Models which come with suction cups are the easiest since they do not require any glue or adhesive taps and can be repositioned easily as well. A bathroom mirror should be suitable for all members of the family and this is the reason why mirrors with 360-degree swivel arm are preferred over models which cannot be adjusted at any angle. These mirrors are fitted on the wall with powerful suction technology. They are easier to install and can be moved from one wall to another easily. Most travel fogless mirrors also come with suction cups. This type of attachment method is more permanent and requires adhesive strips and glue for the mirror to be attached to the wall. This is the simplest type of attachment method as it needs nothing but a shower hook for hanging the mirror on the wall. The hook is attached on the wall with an adhesive tape and the mirror can be taken off the hook whenever required. Bathrooms which do not have a lot of natural light can make it difficult to shave while using the fogless mirror. Mirrors with LED light are better options in this case as they are illuminated and help the user get a better and clear picture while using the mirror. Since these mirrors are designed for shaving or brushing while using the shower, a separate storage hook for keeping the razor or the tweezers is essential. These accessory hooks can also be used to hang the loofah or any other bathroom essential. Check if the model you are planning to purchase is easy to store when not in use as mirrors can break easily if not stored properly. This is especially important if you are buying a fogless mirror for travelling purposes. Most fogless shower mirrors are generally priced higher than normal mirrors since they come with a special coating but you can get a good fogless mirror in about 15$ to 30$ depending on its features and brand. They help you get a closer view when you are trying to shave or cleanse your face while in the shower. You can use this mirror to multitask while completing your morning shower to save some time. You can even brush your teeth or scrub your face with such mirrors. These mirrors do not require any type of complex installation or tools and are quite easy to install on any type of surface. Most of the models come with suction mechanism which can be used to adhere or remove the mirror from the wall. Since these mirrors are lightweight and compact in size, they are very good for travel purposes as well. This is a great advantage for people who shave regularly and want a mirror handy while travelling for their grooming sessions. Fogless mirrors are made up of shatterproof glass which is sturdier and safer as compared to normal mirror glass. This makes these mirrors safer as they break less often and do not leave shards of glass on your bathroom floor even if they fall and break. These mirrors are not as bulky and big as normal mirrors and can be hung anywhere on the shower wall with an adhesive glue or the hooks which are provided with the mirror. You do not have to break any tile or disturb your existing bathroom décor to fit a fogless shower mirror. 1. How to clean and maintain a fogless shower mirror? Fogless mirrors require some additional care when it comes to cleaning and maintaining them as the coating can get damaged with aggressive cleaning. If you are wondering how to clean a fogless mirror, you can use a squeegee or a damp cloth to wipe down the excess water from the mirror and then spray some WD-40 spray on the mirror. Wipe off the excess spray and then dry the mirror with a dry towel or paper tissue. This will make your mirror look clean and fogless again. 2. How do I keep my bathroom mirror from fogging up? A few tricks like rubbing soap on the mirror before a shower or spraying vinegar solution on it work well for a shower mirror and keep it from fogging up. Keeping the temperature of the mirror high also prevents fogging as the vapours from the hot shower do not find a cold surface to condense on. To solve this, you can run a cold shower for a minute or so before switching on to hot shower so the whole shower area will become cooler and fog will not form. Smaller bathroom spaces would need a longer cold shower to prevent fog formation. 3. Which is the best Fogless Shower Mirror with Lights? If you do not have a lot of natural light in your bathroom, the ToiletTree Products Deluxe LED Fogless Shower Mirror with Squeegee can be very useful for you as it is the best fogless shower mirror with light. An LED fogless shower mirror is also great for cleansing your face and tweezing while showering. 4. Which is the best Fogless Shower Mirror with Squeegee? 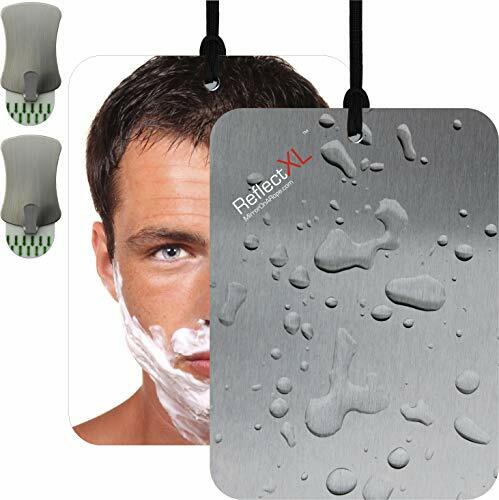 The ToiletTree Products Fogless Shower Mirror is the best fogless shower mirror with squeegee. The Brookstone Fogless Shower Mirror is another model which comes with a squeegee. 5. Which is the best Fogless Shower Mirror with Bluetooth? 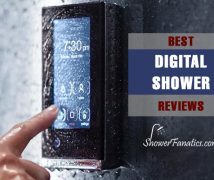 The ART+SOUND AR6001WH Bluetooth Wireless Shower Speaker with a built in fogless shower mirror is the best fogless shower mirror with Bluetooth. It comes with inbuilt microphone and splash-proof speakers to help you enjoy your morning showering routine while listening to your favorite music. Final Thoughts – Which is the Best Fogless Shower Mirror? In our opinion, the ToiletTree Fogless Shower Mirror is one of the best fogless shower mirrors if you are confused about what is the best fogless shower mirror. It is priced well, is easy to use, and comes with a squeegee as well. This model remains fog-free for the entire shower duration since it is of the reservoir type and is easy to maintain too since it doesn’t require any coating. If you are looking for the cheapest one, then the Deluxe Shave Well Fog-free Shower Mirror is the best fogless mirror for shower. 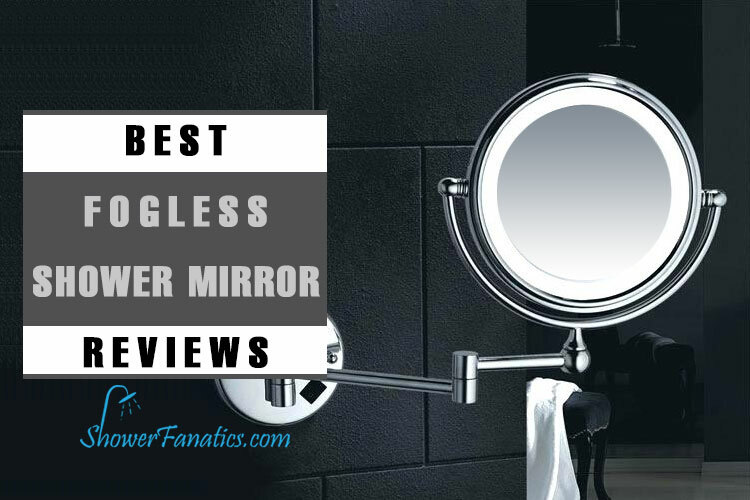 We hope that this detailed comparison guide along with fogless shower mirror reviews would help you find the best fogless shower mirror for your bathroom easily. 3.1 What is a Fogless Shower Mirror? 5 Final Thoughts – Which is the Best Fogless Shower Mirror?